Skip the line at the bakeshop and make your own cherry Danish dessert! 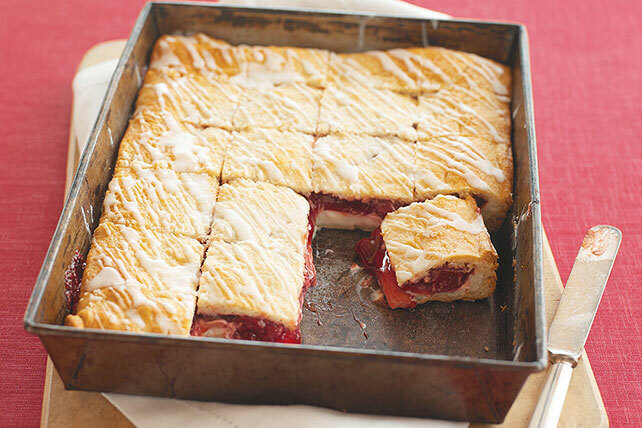 These PHILADELPHIA-Cherry Danish Dessert squares take just 15 minutes of prep. Unroll 1 can crescent dough into 2 rectangles; press onto bottom of 13x9-inch pan sprayed with cooking spray, firmly pressing perforations and seams together to seal. Beat cream cheese, 3/4 cup sugar, egg white and vanilla with mixer until blended; spread onto crust. Cover with pie filling. Unroll remaining can of crescent dough into 2 rectangles; pat into 13x9-inch rectangle, firmly pressing perforations and seams together seal. Place over pie filling. Bake 25 to 30 min. or until golden brown; cool slightly. Mix milk and remaining sugar until blended; drizzle over dessert. Enjoy a serving of this easy-to-make Danish on occasion. Prepare using apricot or raspberry pie filling. Or, substitute 1 pkg. (12 oz.) BAKER'S Semi-Sweet Chocolate Morsels or 2 cups of your favorite chopped PLANTERS Nuts for the pie filling. Prepare using refrigerated reduced-fat crescent dinner rolls, PHILADELPHIA Neufchatel Cheese and fat-free milk.